The NFL Draft will open on May 8 in New York City with the Cleveland Browns holding two selections in the first round and 10 draft picks over all. Over the course of the three-day draft, Browns general manager Ray Farmer will face a puzzle that has continually befuddled his predecessors ever since the Browns entered the National Football League in 1950. How can the team find a quarterback to lead them to their first championship since 1964? Anyone who has watched the Browns since they returned to the league in 1999 knows that quarterback has been the one position on the team that has been a continual nightmare. But the problem goes back even further than that. Since the mid-1970s, when we first started spending our Sunday afternoons with those guys in the orange helmets, the Browns have had exactly two good quarterbacks – Brian Sipe and Bernie Kosar. You can throw in Vinnie Testaverde in 1994 and Derek Anderson in 2007, if you’d like, but they were both one-year wonders and neither was drafted by the Browns. And therein resides the problem. Since joining the NFL, the Browns have drafted 14 different quarterbacks in the first three rounds of the NFL Draft (not the supplemental draft, where they landed Kosar). Six of those quarterbacks never started a game in the league; four never even played in a game. Only two ever started a playoff game for the Browns and just one made the Pro Bowl. Some of the names of those failed quarterbacks are familiar ones – Tim Couch, Brady Quinn, Brandon Weeden – while some are only remembered through faded photographs or yellowed press clippings, players like Mike Phipps, Bobby Garrett and Harry Agganis. Those Browns fans who are up on their team history will recognize why we singled out those six players, of course. 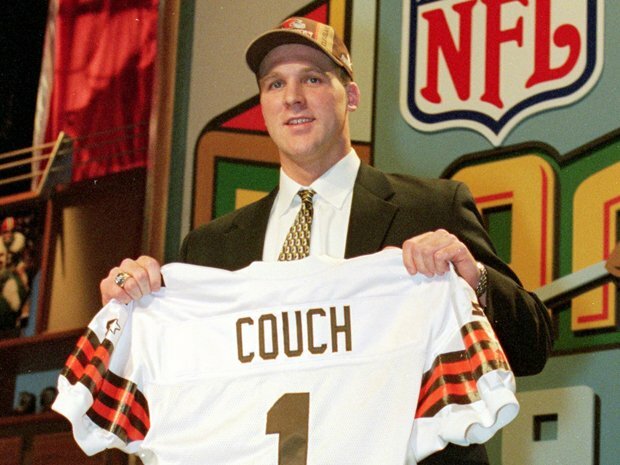 Remember those 14 quarterbacks we mentioned that the Browns have drafted in the first three rounds over the years? Well, six of them were taken in the first round and they are ones we referenced in the previous paragraph. That leads us back to the challenge facing Farmer come the second weekend in May. While it is presumed by many that the Browns will select a quarterback with one of their first round picks from a group that includes Johnny Manziel, Teddy Bridgewater, Blake Bortles and Derek Carr, among others, the odds of Farmer finding the answer to the quarterback puzzle in the first round are not in his favor. Does that mean that if the Browns select a quarterback in the first round they are a guarantee to fail? Of course not. So in an effort to help Farmer, who is still new to the Browns, remember the past (as painful as it may be) so that he may not repeat it, over the next week we will be taking a look back at the six quarterbacks the Browns have selected in first round over the years. All were expected to fill an important void on the team. All failed to work out for a variety of reasons. Such is the ongoing joy of Cleveland Browns football.